1991-05-16 First worldwide family litigation filed litigation Critical https://patents.darts-ip.com/?family=10600094&utm_source=google_patent&utm_medium=platform_link&utm_campaign=public_patent_search&patent=EP0251591(B1) "Global patent litigation dataset” by Darts-ip is licensed under a Creative Commons Attribution 4.0 International License. The present invention relates to an oral hygiene composition containing an antibacerial agent, the function of which is to retard the accumulation of dental plaque and hence reduce the occurrence of caries, calculus and periodontal disease. Dental plaque forms as a thin film on the surface of teeth, being composed of an aggregation of bacteria and a surrounding matrix. Subsequent mineralisation of the plaque on the enamel surface leads to the formation of calculus. Plaque is now considered to be the prime etiological factor in the development of caries, and it is also implicated in periodontal disease. There is also an association between the presence of calculus and the incidence of periodontal disease (see Harry's Cosmeticology, 7th edition, ed. J.B. Wilkinson and R.J. Moore, George Goodwin 1982, pp590-592). Thus, the addition to an oral hygiene composition of an appropriate antibacterial agent, to limit bacterial activity within the oral cavity and hence reduce the growth of plaque, should help to suppress the incidence of caries, calculus and periodontal disease. U.S. Patent No. 4 022 880 discloses the use of halogenated bis-phenols and halogenated diphenyl ethers as antibacterial agents in oral hygiene compositions. A problem associated with the use of such antibacterial agents is that, due to their lipophilic nature, they tend to partition into a hydrophobic oil phase and a surfactant micellar phase and are thereby rendered unavailable for adsorption onto the oral surfaces. It has now been found that by incorporating certain levels of soluble, alkali metal pyrophosphates into the aqueous oral hygiene formulations, the adsorption of the anti-bacterial agent can be enhanced. The preferred weight range of compound of formula (I) is from 0.01 to 1.0%, more preferably 0.05 to 0.5%, the preferred weight range of the abrasive is from 20 to 75%, and that of the dialkali or tetra-alkali metal pyrophosphate salt, or mixture thereof is from 2 to 10%. Water should preferably be present in an amount of from 2% to 95%, more preferably from 5% to 50%. The composition may be in the form of a dentifrice or mouthwash, preferably a dentifrice. Examples of dentally acceptable abrasives are insoluble calcium salts such as calcium carbonate, dicalcium phosphate and calcium pyrophosphate; and also alumina; silica and synthetic plastics resin particles. The silica abrasive can be a precipitated silica or a silica gel, such as the silica gels described in U.S. Patent No. 3538230. Preferred silica gels are marketed under the trade name 'Syloid' by W.R. Grace and Company, Davison Chemicals Division. Preferred precipitated silicas are those marketed under the trade name 'Zeident' by the J.M. Huber Corporation. The pyrophosphate component should have a high degree of available pyrophosphate anions, and accordingly the preferred abrasives are non-calcium based materials such as silica or alumina so as to avoid the formation of insoluble calcium pyrosphate. Calcium pyrophosphate itself, however, can be used as the abrasive since this will not lead to such difficulties. Other insoluble calcium salts can be used provided the formation of free calcium ions is suppressed, and this may be carried out using the method disclosed in EP-A- 0 092 929. Thus, when the abrasive is calcium carbonate, a soluble carbonate such as sodium carbonate is included in the composition. Similarly when the abrasive is calcium phosphate, a sodium phosphate may be included. Na4P2C)7, K4 P207, Na2K2P207, Na2H2P207, K2H2P207. Mixtures of any two or more of these materials may be used, the upper percentage limit of each component being dictated largely by solubility and taste considerations. Ionic fluorine-containing compounds may also be present in the composition of the invention, and these may include ionic fluorides, such as alkali-metal fluorides, preferably sodium fluoride, and/or ionic monofluorophosphates. A preferred ionic monofluorophosphate is an alkali-metal monofluorophosphate, especially sodium monofluorophosphate. When the composition contains sodium fluoride and a calcium containing abrasive, the formation of free calcium cations can be suppressed, using the method disclosed in EP-A-0 092 929. 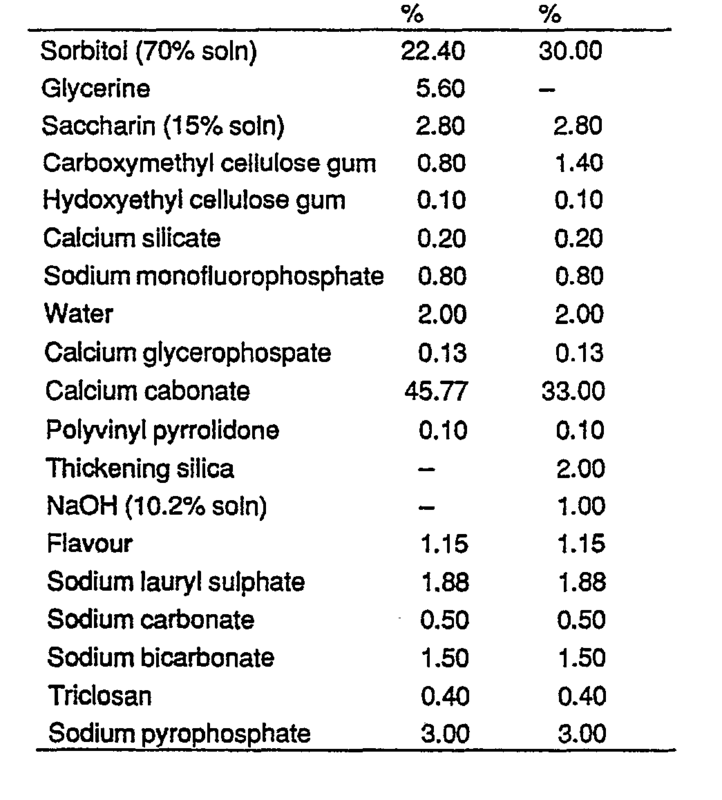 The compositions of the invention may optionally contain other agents known to enhance the anti-caries effect of monofluorophosphate, such as calcium glycerophosphate; this being incorporated in a weight ratio of up to 1:3, preferably 1:20 to 1:3, compared to the total weight of monofluorophosphate salt. Compositions of the present invention may be produced by admixture of the various ingredients. The compositions of the invention will also usually contain surfactants, gelling agents and other excipients such as flavouring and colouring agents. The surfactant is normally a water-soluble non-soap or synthetic organic detergent. Suitable surfactants include the water-soluble salts of: higher fatty acid monoglyceride monosulphates (for example sodium hydrogenated coconut fatty acid monoglyceride monosulphate); higher alkyl sulphates (for example sodium lauryl sulphate); alkylarylsulphonates (for example sodium dodecylbenzenesulphonates); and higher alkyl sulphoacetates (for example sodium lauryl sulphoacetate). There may also be used the saturated higher aliphatic acyl amides of lower aliphatic amino carboxylic acids having 12 to 16 carbon atoms in the acyl radical and in which the amino acid portion is derived from the lower aliphatic saturated mono- aminocarboxylic acids having 2 to 6 carbon atoms, such as the fatty acid amides of glycine, sarcosine, alanine, 3-aminopropanoic acid and valine, particularly the N-lauroyl, myristoyl and palmitoyl sarcosi- nate compounds. Conventional non-ionic surfactants may also be included, if desired. The surface-active materials are generally present in an amount of 0.05 to 15%, preferably 0.5 to 15%, more preferably 0.5 to 5% by weight of the composition. In general liquid components in the compositions will comprise chiefly water, glycerine, sorbitol and/or a glycol, including suitable mixtures thereof. Suitably, the glycol is propylene glycol or a polyethylene glycol. It is preferred to use also a gelling agent in dental creams, such as natural or synthetic gums or gum- like materials, e.g. Irish Moss, gum tragacanth, guar gum, sodium carboxymethylcellulose, hydroxyethylcellulose, polyvinyl pyrrolidone, starch or thickening silica. The gelling agent content is usually up to 10% and preferably 0.01 to 5% by weight of the preparation. Other materials may be added, such as sweetening agents, for example soluble saccharin, flavouring oils such as oils of spearmint, wintergreen, peppermint, chloroform, colouring or whitening agents such as titanium dioxide, preservative such as sodium benzoate, emulsifying agents, silicones, alcohol, menthol, chlorophyll containing compounds, for example, sodium copper chlorophyllin and agents for sensitive dentine, for example strontium salts, formaldehyde. The compositions of the invention may also be in a form of other oral hygiene compositions, or example, the ingredients may be incorporated in mouthwashes of the suspension type, or in compositions which will be chewed by the user, for example, chewing gum, tablets, pastilles and lozenges. These compositions will contain the conventional base materials together with suitable flavours and sweetening agents and may be formulated in known manner. Compositions according to the invention are able to reduce plaque growth, thereby having an anti-caries effect. 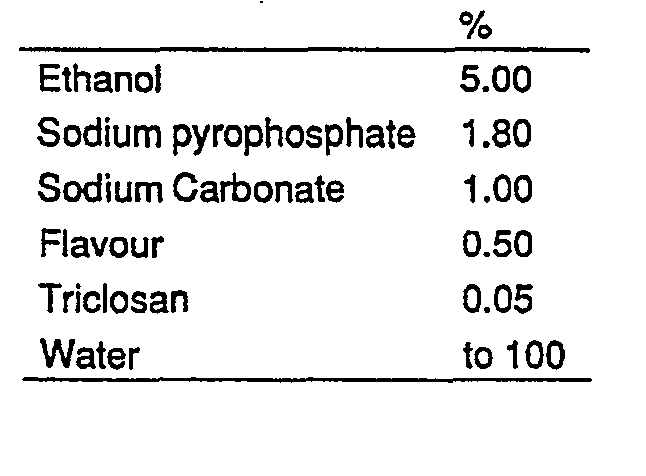 The data in the test section show that the inclusion of a pyrophosphate salt, such as sodium pyrophosphate, to a mouthwash comprising the antibacterial agent triclosan, results in a significant reduction in the growth of dental plaque, over and above that achieved using a mouthwash comprising triclosan alone. The compositions of the invention are illustrated by the following examples; in which Examples 1 to 5 are dentifrices, Example 6 is a mouthwash, and Example 7 is Test Data. The effect of mouthwashes on plaque growth was determined using the method described by Stean H.S. and Forward G.C. (Community Dent. Oral Epidemiol., 1980,8,420-423). Thirty volunteers cleaned the buccal surfaces of their teeth free of visible plaque using a control den- trifice, after which they rinsed for 1 min. with 10 ml of one of the two test mouthwashes. (ii) the gingival margin plaque index (GMPI) (Harrap C.J., J. Clin. Periodontal., 1974, 1, 166-174). The mouthwashes were allocated to the subjects in a balanced, randomised fashion and the procedure repeated until each volunteer had used both of the test mouthwashes. The identity the products was unknown to the volunteers and to the examiner. 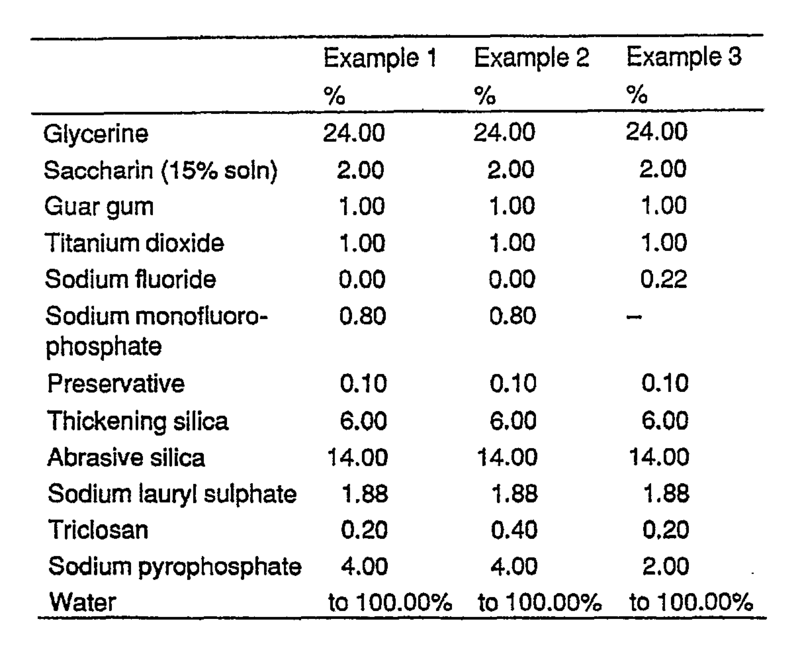 The results presented in the table show that the addition of sodium pyrophosphate to a mputhwash containing triclosan significantly reduced the growth of plaque as measured by both plaque area and plaque length, compared to a mouthwash containing triclosan alone. Therefore, the addition of sodium pyrophosphate to such a composition would appear to improve the ability of the composition to reduce dental caries. characterised in comprising from 0.1 to 15% by weight of a dialkali or a tetra-alkali metal pyrophosphate salt, or a mixture thereof. 2. A composition according to claim 1 wherein the weight range of the compound of formula (I) is from 0.01 to 1.0%. 3. A composition according to claim 2 wherein the weight range of the compound of formula (I) is from 0.05 to 0.5%. 4. A composition according to anyone of the preceding claims wherein the weight range of the abrasive is from 20 to 75%. 5. A composition according to anyone of the preceding claims wherein the weight range of the dialkali or tetra-alkali metal pyrophosphate salt, or mixture of, is from 2 to 10%. 6. A composition according to any one of the preceding claims in which water is present in an amount of from 2 to 95%. 5,5'-dichloro-2,2'-dihydroxydiphenylmethane, 2,2'-dihydroxy-3,5,6,3',5',6'-hexachloro-diphenylmethane, 3,3'-dibromo-5,5'-dichloro-2,2'-dihydroxydiphenylmethane, and 2,4,4'-trichloro-2'-hydroxydiphenyl ether. 8. A composition according to any one of the preceding claims in the form of a dentifrice in which an abrasive is present, which abrasive is selected from calcium carbonate, dicalcium phosphate, calcium pyrophosphate, alumina, silica, synthetic plastics or resin particles. 9. A composition according to any one of the preceding claims further comprising a water soluble ionic fluorine-containing compound. 10. A composition according to any one of the preceding claims for use in the prevention or reduction of dental plaque in the human or animal body. 11. A process for the preparation of a composition according to any one of claims 1 to 9, which process comprises mixing together the ingredients thereof in the necessary proportions. BR9712036A (en) * 1996-09-12 2000-01-18 Smithkline Beecham Consumer remineralization composition. ES2290007T3 (en) * 1999-05-20 2008-02-16 Ciba Specialty Chemicals Holding Inc. Hydroxydiphenyl ether compounds. Opponent name: THE PROCTER & GAMBLE COMPANY.